Before even jumping into the evolutionary biology material, what is a trade-off? Well, a trade-off is when a choice must be made between multiple things that are either incompatible or an increase in one thing might lead to a decrease in another. Theodore Garland Jr. gave the perfect example, “…money spent on rent is not available to buy food.”, makes sense. In a past post we discussed correlated traits, one can think of a biological trade-off as simply negatively correlated traits (i.e. if one trait goes up, the other goes down). A one-trait trade off is the result of an opposing selection on that one trait via a different environment or through perhaps a limiting resource (Agrawal, Conner, & Rasmann 2010). An example of a single trait trade-off in humans is the weight of a new born baby. A higher birth weight provides a higher chance of survival in the first few weeks, but babies that are too large have higher mortality rate (Karn & Penrose 1951). Thus there is a trade-off in the birth weight that greatly impacts the chance of survival. When two or more traits are involved a multiple-trait trade-off can be thought of as having a single resource where it is impossible to use this resource to increase more than one trait at once. If it sounds a bit confusing, for now just think of the aforementioned example of taking your money (i.e. the resource) and either paying rent or buying food (which can be thought of as the two traits). An example of a multiple-trait evolutionary trade-off can bee seen in different species of howler monkeys (shown in Fig. 1). Dunn et al. 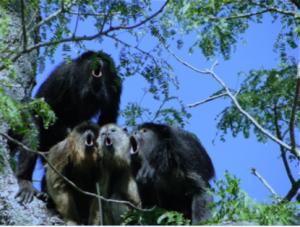 just recently had their paper “Evolutionary Trade-Off between Vocal Tract and Testes Dimensions in Howler Monkeys” published in Current Biology. In their research they discovered that the bigger a male’s vocal organ and louder the roar, the smaller their testes resulting in less sperm production. The University of Cambridge made quite an interesting few minute clip, Calls vs. balls: An evolutionary trade-off, in which they discuss the findings of this paper and you get to hear Dr. Jacob Dunn imitate the roar of a howler monkey. Although it is not exactly a clear cut answer as to why this trade-off exists, it was observed that the loud species tend to live in a social model where there is only one male dominating a set of females, as compared to the species that instead have bigger testes (and weaker roar) live in groups of multiple males where the females mate with all the males. The first scenario would lead rise to selecting for a louder roar to claim territory and to ensure having females to reproduce with, while the second scenario would give rise to selecting for larger quantities of sperm since this would be the way to ensure offspring when the females are mating with all the males in their group. As mentioned before about the single resource and multiple traits to invest in, Dunn et. al suggests that the reason for this trade-off is simply the howler monkeys do not have sufficient energy to invest in the acts of loud roaring combined with large sperm production. 1. Agrawal, Anurag A., Jeffrey K. Conner, and Sergio Rasmann. (2010). “Tradeoffs and negative correlations in evolutionary ecology.” Evolution since Darwin: The First 150 Years. 243-268. 2. Dunn, Jacob C., Lauren B. Halenar, Thomas G. Davies, Jurgi Cristobal-Azkarate, David Reby, Dan Sykes, Sabine Dengg, W. Tecumseh Fitch, Leslie A. Knapp. (2015). “Evolutionary Trade-Off between Vocal Tract and Testes Dimensions in Howler Monkeys”. Current Biology. 25(21): 2839-2844. 3. Garland Jr., Theodore. (2014) “Trade-offs”. Current Biology. 24(2): R60-R61. 4. Karn, M. N. and L. S. Penrose. (1951). “Birth weight and gestation time in relation to maternal age, parity and infant survival. Ann. Eugenic. 16: 147-164. This entry was posted in Evolution 101 and tagged Biological Evolution, Evolution 101. Bookmark the permalink.